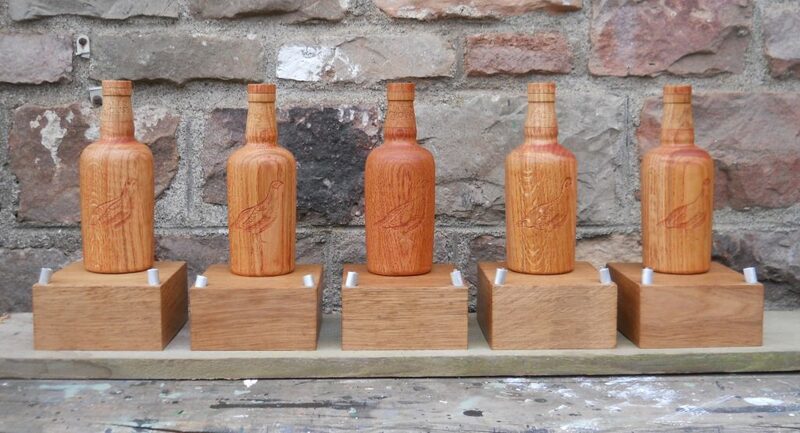 In 2014, I was asked to turn and carve oak replicas of the distinctive bottles that ‘Naked Grouse’ whisky is sold in. They were to be used in the promotional launch of the whisky in the UK. As part of the commission, I also carved the logos of five different bars in the prestigious Mayfair and Marylebone districts of London live in the bars themselves. The Glasgow-based marketing company Material approached me during the summer of that year to ask if I could make some oak sculptures as part of a promotional launch. The makers of ‘Famous Grouse’ whisky were introducing their new premium malt blend, called ‘Naked Grouse‘, to customers in the UK. The marketing centred on the craftsmanship involved in producing fine whisky. 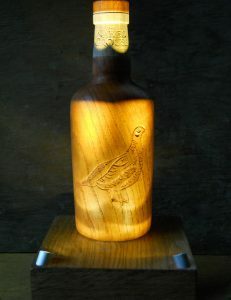 The sculptures were replicas of the Naked Grouse whisky bottle, turned and carved in oak which originally grew on the Quantock Hills in Somerset. 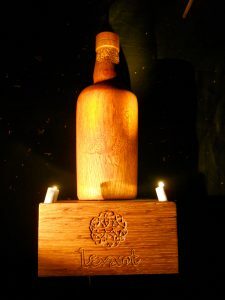 They were mounted on oak plinths that had LED lights installed to illuminate the bottle. 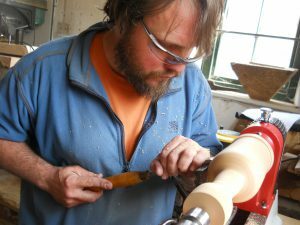 It was fun doing some woodturning again to make the bottles, especially when an electrical fault in the first lathe shorted out the workshop’s electrics! The labels and embossed grouse design were replicated using a Dremel hand drill. 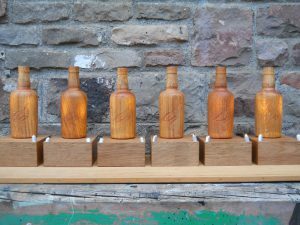 The bottles were then stained to match the colour of the whisky as much as possible. 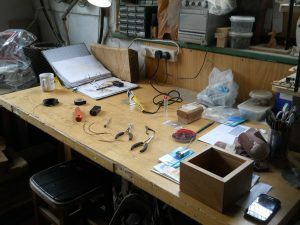 Fitting the LED lighting systems into the oak plinths was quite interesting; I haven’t studied physics since school, so it was quite an education learning about resistors, diodes and the like! 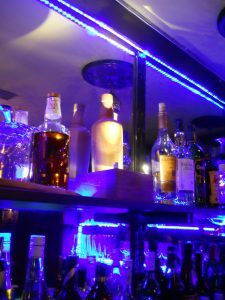 Six bottles and plinths were made in the end, of which five were used in the promotion as one bar dropped out at the last minute. 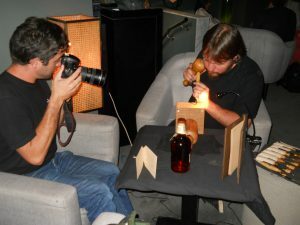 Then it was time for the next stage of the project: live carving at bars in the prestigious Mayfair district of London! The demonstrations involved carving the logo of each bar onto each plinth in the establishments themselves. 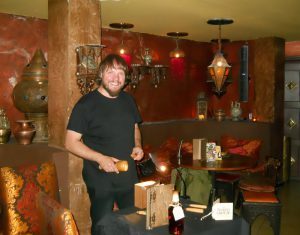 The sculptures were then left at each bar. The bars themselves ranged from a Lebanese restaurant (complete with Arabian dancers) through a bar having a ‘beach party’ to a very exclusive place with no sign and a doorman. It was great fun doing the live carving, as well as a bit of a challenge to reproduce the logos with a time limit and an audience. I’m happy to say that everyone was very pleased with the finished sculptures.